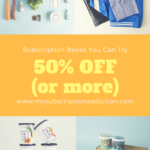 Check out the latest SaloonBox Coupon on My Subscription Addiction! SaloonBox Labor Day Deal – 50% Off First Month With A Pre-Paid Subscription! SaloonBox Cyber Monday Deal – First Box Free With 6-Month Subscription! SaloonBox Black Friday Deal – 50% Off First Month With A Pre-Paid Subscription!